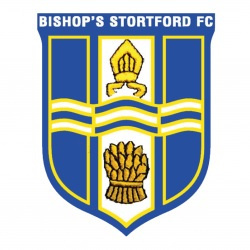 As kick off in Bishop Stortford's Velocity Trophy Quarter Final tie at Merstham approached, the away side announced- via social media- the loan signings of keeper Arthur Janata from Leyton Orient and midfielder Ben Worman from Cambridge United. Janata started this season on loan to Waltham Abbey, and indeed had made fifteen starts for the Capershotts side, including five clean sheets- but last night he was the Blues hero, thrust immediately into the side and making two penalty shootout saves as the Blues progressed to a semi-final tie at Enfield Town. Each of our three previous Quarter Final ties had ended in a 4-1 victory for the home side, and given Merstham's recent form-unbeaten in seven matches- when Ollie Cook gave them the lead in the 36th minute the Blues might have felt they had reason to worry. But a Haaroon Belaid equaliser just before the hour brought them level, and after no further goals were forthcoming Bishop's won a penalty shootout 3-2 to book a trip to Donkey Lane. Worman, who signed a three year professional deal with the League Two outfit in September and has featured in the U's first team, also played the entire match.  The Worthing Hokey-Cokey Two in and three out, as Hinshelwood shakes his squad about!